When it comes to make-up, my knowing and my doing are two extremes. I am turning into a huge Liza Eldridge fan and a part of me believes that mimicking those 'beauty' movements and strokes is easy and achievable, yet the other part of me remains shy and restraint when it comes to make-up. The only weapon which has been symbolic of my stepping into lady-hood has been the ohh.so.loyale lipstick. I do wear lipsticks on a regular basis, but I opt for a complete or fuller coverage only for shoots and special occasions like events, weddings or parties. For every other occasion, my trusted and comfortable bet is to wear a lip stain. Though there are so many products like sheer lipsticks, glosses and balms which do render the effect, but I believe owning your favourite lipstick and being able to use it in more ways than one is not only economical, but also helps you space and pick make-up products that suit you best rather than just hoarding on products. 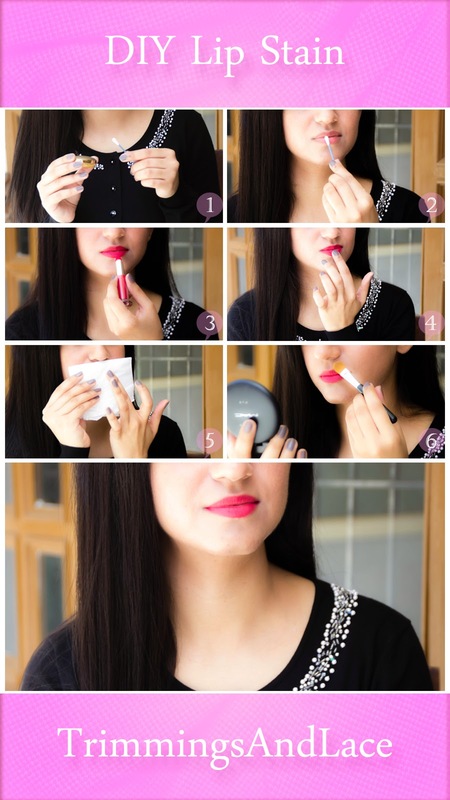 So without much adieu, here's how I wear my lip stain. 1. Your favourite lipstick - Lancôme Pret-A-Plum has been my all time favourite when it comes to wearing a stain. But recently, I've gotten into the Maybelline's '14-Hr Super Stay' range and I swear by these lipsticks like no other. 1. Moisturize and prep your lips for lipstick by gently scrubbing them to get rid of the dead skin. You can use any exfoliator for the same. I usually like to smear a Q-tip with some balm or baby/coconut/olive oil and buff it over my lips. 2. The former helps remove the dead skin and leaves a moisturizing layer of the balm/oil over your lips. This way your lips are soft and supple and ready for the lipstick. 3. The colour I've chosen for this tutorial is a really bright, popping shade of red with a pink undertone. This particular range of lipsticks from Maybelline are extremely hydrating and long lasting. Because this colour is amazingly rich and highly pigmented, the best way to apply it is with a lip brush. However, since I am working to create a stain (and wear down its effect), I used it directly from the bullet. 4. Tap the lipstick into your lips so that it stains the very base of the lips and gets into the nooks and crannies of your lips. 5. Blot your lips with a tissue paper. If you've been successful in step 4, at this stage you'll notice that hardly any colour comes off on the tissue. You can repeat steps three to five for a stronger stain. Alternatively, you can also use a lip pencil to fill in the lips and then use the lipstick to create a stain. 6. Once done, come back with your concealor and/or setting power to cover any spots and smooth the irregularities and harsh lines. I feel wearing a stain is perfect while attending school parties, for college, for everyday work routine, for interviews, for a day shopping or a casual brunch with friends or in general if you prefer your make-up to be natural looking. So ladies, love thy lipstick and dab, tap, blot and stain!